Are you replacing your file server with Office 365 and OneDrive for Business but don&apos;t want to lose the familiarity and ease of working with your files through mapped drives and file shares? Then take a look at Zee Drive to find out how it makes Office 365 work as your new file server. Zee Drive maps OneDrive for Business, team sites, SharePoint Online document libraries, shared with me files and Office 365 group files to network drives giving you access to your files through the familiar interface of Windows File Explorer in a similar way as if you were accessing them from a local file server. Mapped drives are persistent and available when users sign in to their PCs. The mapped drive configuration is managed centrally by Zee Drive so you can easily deploy changes to drive mappings to all users in your organisation. Zee Drive can minimise disruption to end users and greatly reduce the need for training when transitioning to Office 365 because users work with their files in a familiar way. Users can also perform advanced actions such as viewing file version history and sharing their files with their colleagues directly from their Zee Drive mapped network drives in Windows File Explorer. If you are considering deploying Zee Drive to your customers then find out about our Zee Drive partner subscriptions. With a partner subscription you can white label parts of Zee Drive and administer all your customer subscriptions from a single interface. With a partner subscription you can provide a "managed cloud file server" solution for your customers. Try out Zee Drive with a free 7 day trial subscription for 5 users (also includes licences for trialling Zee Drive on hot desk computers and desktop servers). Click the button below to download Zee Drive. Once downloaded, run Zee Drive and follow the steps to setup your trial and activate Zee Drive on your computer. The Zee Drive trial subscription limits the amount of data you can upload or download through your mapped drives in any given 24 hour period to 5,000 file uploads or 3GB of data and 10,000 file downloads or 5GB of data. Zee Drive requires Microsoft .Net 4.5 or above and Windows. Zee Drive is supported on Windows 7, Windows 8 and Windows 10. Trouble running Zee Drive? Click here to contact us. Here is a walkthrough of your Zee Drive trial, from installation and activation, to creating a network drive, and then setting up other users on your subscription. View the Zee Drive subscription agreement here. Download and run Zee Drive, click Next and you should see the screen below. As this is the first time you are running Zee Drive, click the blue link "then click here to set up your trial". On clicking the blue link Zee Drive will guide you through the trial sign up process. First step is to sign in to the Office 365 tenant you want to associate with your subscription. The user you sign in with will become your Zee Drive subscription administrator. 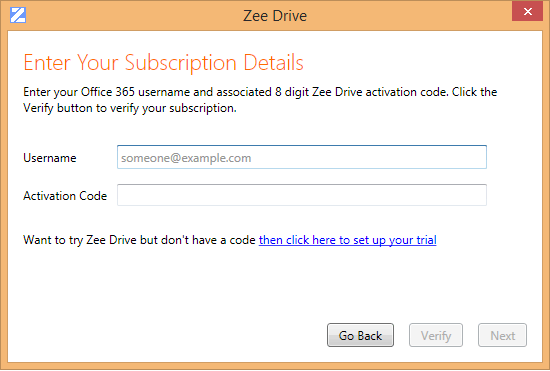 Sign in to the Office 365 tenant you want to associate your Zee Drive subscription with. On the next screen enter a contact email address. An email will be sent to you with your subscription details so be sure to enter the correct contact email address. Zee Drive will then set up your subscription, it shouldn&apos;t take long. Once your subscription has been set up click the Continue button to continue installing and activating Zee Drive on your computer. When you click the Activate button Zee Drive will install and activate your subscription on your computer. Zee Drive will now start up each time you sign in to Windows. Let&apos;s publish your first mapped network drive. We will connect it to your OneDrive for Business. Click on the blue Z icon in the system notification area to open up Zee Drive. As the Zee Drive subscription administrator you have the rights to add network drives and publish them for all users on your subscription. Click the button to open up the action menu and choose "Add or manage your network drives". On the next screen, choose the "Create a network drive" option from the action menu. Enter a name for your network drive. The name is a combination of server name and share name and will appear in Windows Explorer as a network drive. Optionally choose a drive letter, here the letter Z has been chosen. You may want to restrict your network drive to only appear for certain users. For example, you can ensure that only users from the finance department will see the finance mapped network drive. Optionally use Zee Drive&apos;s group targeting feature to target your network drive at specific groups of users. On the next screen choose where to map your network drive to in Office 365. You can connect your drive to OneDrive for Business or to a library or even a subfolder within a library. There are several connection options supported by Zee Drive. Let&apos;s connect our drive to OneDrive for Business of the signed in user. This means that the network drive will dynamically resolve to the OneDrive for Business of whomever is signed in. Click the Create button to create your network drive. You can add more network drives if you like. Here is the network drive that we just created. The next step is to publish our drive to the Zee Drive service. This will make the network drives available to anyone that is on your Zee Drive subscription. It means you can manage the drives centrally and push them out to all users&apos;s computers easily. From the manage network drives page, click the Publish button and then click Publish Now. After a short time your network drive configuration will be committed to the Zee Drive service and also applied to your local computer. Open up Windows File Explorer to see your network drive. Your drive is ready to work with; drag and drop a file in, double click to open etc. Now its time to set up other users on your Zee Drive subscription. From Zee Drive, click the Cancel button on the manage network drives page to take you back to the subscription status page. Click the menu button then choose the "Setup or manage users on your subscription" option. Enter an Office 365 username and click the Add button. The user will be added to your subscription and an activation code generated for them. Provide the activation code to the user and the link to download Zee Drive. When they install and activate Zee Drive (following the same steps above), the drive that you published will automatically be created on their computer ready for them to use. When opening an Office document on a local file server through a mapped network drive, Office will report that the document is already locked for editing if another user has already opened the same document. The user has the option to open the file readonly or wait for the file to be available for editing. This familiar user experience for locked Office documents is supported with Zee Drive mapped network drives. On opening a document in Office, a server side lock is taken out on the document preventing other users from opening the document for editing in Office. When opening an Office document from a Zee Drive mapped network drive, if the document is already locked, Office informs the user and offers some options. Zee Drive attempts to maintain the lock on the document for the duration the document is opened from Zee Drive. On closing the document, the lock is released, allowing another user to open the document for editing. The specific Office applications supported are Excel, Word, and PowerPoint and the document types .doc, .docx, .xls, .xlsx, .xlsm, .ppt, and .pptx. Zee Drive provides capabilities for end users to recover file uploads that have failed, for administrators to identify computers with recovered files, and a special recovery mode to save recovered files from computers where Zee Drive has been deactivated. When a file fails to upload through a Zee Drive mapped drive Zee Drive recovers the file and notifies the user. The user can then save the recovered file to a location on their computer. Zee Drive limits how many files can be held in recovery; if the limits are breached Zee Drive will write-protect the drives temporarily until the user has saved the recovered files. Users have up to 4 weeks to save the recovered files before Zee Drive purges them. Zee Drive notifies the user when files have failed to upload. Users can select the recovered files and save them from Zee Drive to their computer. 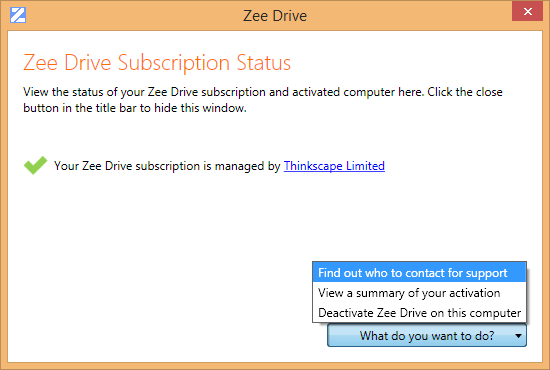 Zee Drive subscription administrators can view reports tracking which computers have unsaved files. Even if a computer has since been deactivated administrators can still discover which computers had unsaved files at the time of deactivation. Administrators can track computers with unsaved files. Zee Drive will startup in recovery mode and list any unsaved files from subscriptions that have been deactivated by the user that is signed in to Windows. Files that failed to save directly from Office (Word, PowerPoint, Excel) will not be recovered as Office prompts the user directly to save the file to another location. A hot desk computer is a type of computer that many people may use but only one person will be on the computer at a time. Examples include shared computers at the office used by temporary or travelling staff, lab computers or school library computers. When Zee Drive is activated on a hot desk computer a shared computer licence will be assigned to it. A user subsequently signing in to the hot desk computer that has a Zee Drive user licence assigned to them (either a personal computer user licence or shared computer user licence) will have their network drives mapped by Zee Drive. A computer can be activated as a hot desk computer manually using the Zee Drive wizard, or automatically through the Zee Drive command line. The command line is useful when you have many hot desk computers to install and activate Zee Drive on. Zee Drive provides a log you can access centrally to track the status of command line activation attempts. To activate as a hot desk computer using the wizard, run Zee Drive (zeedrive.exe) on the computer and enter your Zee Drive administrator username and activation code then click the blue "hot desk computer or desktop server" link. Enter a unique name to identify the hot desk computer on your subscription. When a licenced Zee Drive user next signs in to the hot desk computer Zee Drive will automatically start up for the user and map their drives. 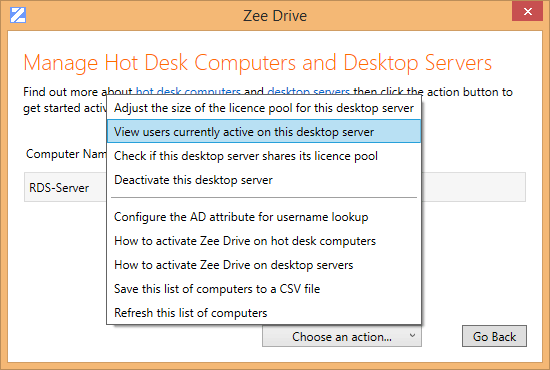 Zee Drive will prompt the user for their Office 365 username if the hot desk computer is not domain joined. Their choice will be remembered so they will not be prompted again then next time they sign in. For domain joined computers, the Office 365 username of the user signing in to the hot desk computer is looked up automatically from Active Directory - users are not be prompted for their Office 365 username. The Active Directory property from which the Office 365 username is looked up defaults to UserPrincipalName. This can be changed to another property such as Mail. Zee Drive provides an alternative method of activation using the command line. This is useful when you have many hot desk computers to activate and want to do that automatically. To activate hot desk computers using the Zee Drive command line choose the &apos;Manage hot desk computers and desktop servers&apos; option from the menu. From the action button now choose the "How to activate Zee Drive on hot desk computers" option. Zee Drive will then walk you through the process of enabling activation with the command line. Command line activation first needs to be enabled. Once enabled you can click the how to use the command line link to view the command line and copy it to the clipboard. Manage hot desk computer activation using the command line. A log of all attempted activations by the command line can be accessed directly from Zee Drive by clicking the View Activation Log button from the above screen. This will help you to track the results of command line activation and troubleshoot those attempts that failed. The activation log showing attempted activations from the command line. To manage the hot desk computers you have activated choose the "Manage hot desk computers and desktop servers" option from the menu on the Zee Drive status screen. From the management screen you can deactivate your hot desk computers or set the Active Directory username lookup attribute. To upgrade a hot desk computer manually run Zee Drive on the hot desk computer and enter your administration username and activation code then click the blue &apos;hot desk computer&apos; link. You can now choose to deactivate or upgrade Zee Drive. A desktop server is a type of computer that provides remote desktops, virtual desktops and remote apps to a community of users. Examples include Remote Desktop Services (RDS), Citrix XenApp, Citrix XenDesktop and virtual desktop infrastructure (VDI). When activating Zee Drive on a desktop server, the desktop server will be associated with a shared computer licence pool. The pool should have as many shared computer licences assigned to it as you expect to have users signed on to the server concurrently. A user subsequently signing in to the desktop server that has a Zee Drive user licence assigned to them (either a personal computer user licence or shared computer user licence) will have an available shared computer licence will taken from the pool and assigned to the user for the duration of their session. Zee Drive will then map the user&apos;s drives. You can associate many desktop servers with a single shared computer licence pool. Therefore if you have multiple load balanced servers they can all use the same pool of shared computer licences. To activate as a desktop server run Zee Drive (zeedrive.exe) on the computer and enter your Zee Drive administrator username and activation code then click the blue "hot desk computer or desktop server" link. Click the Next button then enter a unique name to identify the desktop server on your subscription. Click the Next button and choose to activate as a desktop server. If this is your first desktop server activation then choose to create a new licence pool. If you have a load balanced environment you could join this desktop sever to an existing licence pool. If you choose to create a new licence pool you will need to choose how many shared computer licences to assign to the pool. Follow the remaining wizard steps to complete activating the computer as a desktop server. When a licenced Zee Drive user next signs in to the desktop server Zee Drive will automatically start up for the user and map their drives. You can check which users are currently signed in to the desktop server and consuming a shared computer licence. Choose the &apos;Manage hot desk computers and desktop servers&apos; option from the administration menu. Select your desktop server from the list then from the action button choose the option &apos;View users currently active on this desktop server&apos;. You can now view a list of users currently active on the desktop server and any related desktop servers from the same licence pool. To upgrade a desktop server manually run Zee Drive on the desktop server and enter your administration username and activation code then click the blue &apos;desktop server&apos; link. You can now choose to deactivate or upgrade Zee Drive. If a file or folder change is not yet showing in a user&apos;s mapped drive the user can download the latest changes on-demand. Click the F5 button (refresh button) on your keyboard whilst Windows File Explorer has the focus and Zee Drive will update the folder in real-time to show the latest changes. In the example below a recently added document, "Myles Team Presentation.pptx", is not yet showing in Windows File Explorer so just click the F5 button on your keyboard. After clicking F5 the new document will appear. 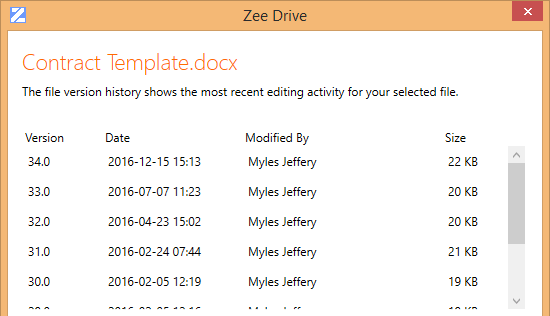 The version history of files in your Zee Drive mapped drives can be viewed and managed from the Windows File Explorer context menu. Zee Drive will show a list of the latest versions including the version number, modification date, file size and whom made the change. A range of file version management functions are available to the user which can assist them in understanding which changes have been made to their document over the course of time. These functions include; opening a version in the associated application, saving one or more versions to the local computer, comparing two versions and viewing the differences (Word documents only), restoring a version to make it the latest one. Select a file in File Explorer, right click the mouse button to show the context menu then choose the version history command. Zee Drive will then display the recent version history of the selected file. File versions can be saved to your desktop to assist in discovering when a particular change was made to a file. Select the file versions to save then choose the save command. The files will be saved to your chosen location and appended with the version number. Word and Excel document versions can be compared to view the differences between the versions. Word document differences are shown within Word whilst Excel document differences are shown in the Office 2016 Spreadsheet Compare tool. Select the two versions of the document to compare then choose the compare command. The versions will be downloaded and then compared to show the differences. Word itself is used to show differences between Word documents. When comparing Excel document versions the Office 2016 Spreadsheet Compare tool is used. 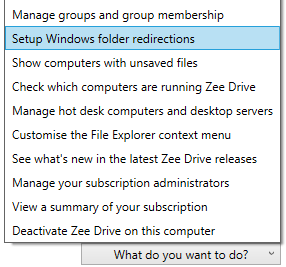 Zee Drive subscription administrators can choose whether or not to show the version history command on the File Explorer context menu. When a user shares a file or folder with you from their OneDrive for Business the shared item will appear in your Shared With Me area in Office 365. Zee Drive can show these files and folders directly in a mapped network drive. Zee Drive groups the shared items in folders named after the user that shared them. For example, if user "Myles Jeffery" shares a file with you then the shared file will appear in the folder "Myles Jeffery" in the mapped network drive. Files and folders shared with you are grouped under folders bearing the name of the person that shared the item. Users can share their OneDrive for Business files and folders directly from Windows File Explorer. When their file or folder has been shared it will then appear in the Shared With Me area of the user they shared with. Select the folder you want to share from your OneDrive for Business and select the sharing command. Zee Drive will then show the sharing wizard. You can see which users you are already sharing with. You can share with more users or stop sharing with users you have previously shared with. Choose which users to share your folder with. Once the folder has been shared it will then appear in the Shared With Me area of the user you have shared with. If a network drive has been mapped to Shared With Me then the user can access the shared folder directly from there. Users can access shared files and folders directly from their mapped drive. Zee Drive subscription administrators can choose whether or not to show the share your files command on the File Explorer context menu. The share your files command will only appear on the Windows File Explorer context menu if a user selects a file or folder from their own OneDrive for Business mapped network drive. That is, they can only share their own files, they can&apos;t share files from team sites or groups. Users can share files only with their colleagues; users from their own Office 365 tenant. They cannot share with external users with this command. For users to see the files that have been shared with them, the Zee Drive subscription administrator should map a network drive to Shared With Me. Files and folders shared with a user will then show in their Shared With Me network drive. Users can restore files they have deleted from Zee Drive mapped drives by opening the File Explorer context menu on a folder then selecting the deleted files they want to restore. Select the folder the files were deleted from and choose the restore command from the File Explorer context menu. Zee Drive will show a list of deleted files from the SharePoint recycle bin that are in the selected folder and its subfolders. Only files deleted by the user will be shown; files deleted by other users will not be shown. Select the deleted files that you want to restore and choose the restore command from the action button. Click the Restore button to start the restoration process. Zee Drive will then restore the files you have selected. You can cancel out of the restoration process at any time. Once the restore has completed the restored files will show in File Explorer. If you have a lot of deleted files and having difficulty locating the one you want to restore, use the filter command from the action button. You can then specify a file name filter. Zee Drive will show only matching files. Use a filter to show only matching files. If users choose to permanently delete the files rather than restore them (by choosing the delete option from the action button) the files are removed from their SharePoint recycle bin and sent to the second stage SharePoint recycle bin which can be accessed by site collection administrators in SharePoint. 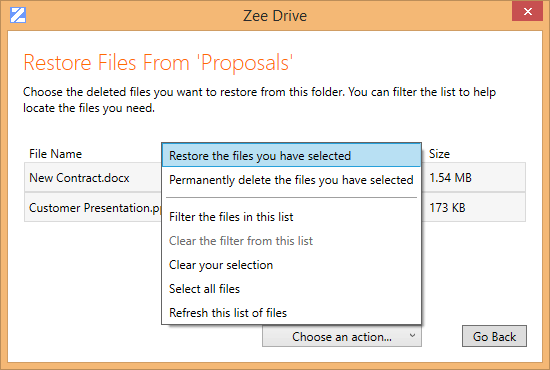 Zee Drive subscription administrators can choose whether or not to show the restore deleted files command on the File Explorer context menu. The restore deleted files command will only show on the context menu if the folder selected is a document library or a folder in a document library. It will not show for folders that are connected to SharePoint sites. When copying a file to a Zee Drive mapped network drive with Windows File Explorer the Windows File Explorer progress bar will show an accurate representation of the file copy progress made to SharePoint Online/OneDrive for Business. The Windows File Explorer progress bar shows copy speed, copy progress and an estimate of time remaining. Users can quickly search for files and folders directly from the Windows File Explorer context menu. Zee Drive leverages SharePoint&apos;s full text search index so that both file names and file contents can be searched very quickly without the need for a local search index on the computer. Select a folder to search then choose the search option from the context menu. The search window will open. Enter your search criteria and click the Search button. Files that match your criteria are then shown. Select a file and choose either to open the file or locate it in File Explorer. If you choose to locate in File Explorer, File Explorer will open up the folder containing the file and select it automatically. To search for an exact phrase enclose your keywords in double quotes. To limit your search results to particular document types enter the document extension with a leading period character. For example to limit the search to Word documents only enter .docx in your query. Searching for an exact phrase or limiting results to specific document types. The search option on the context menu will only show if the drive or folder selected is a document library, a folder within a document library, or OneDrive for Business. 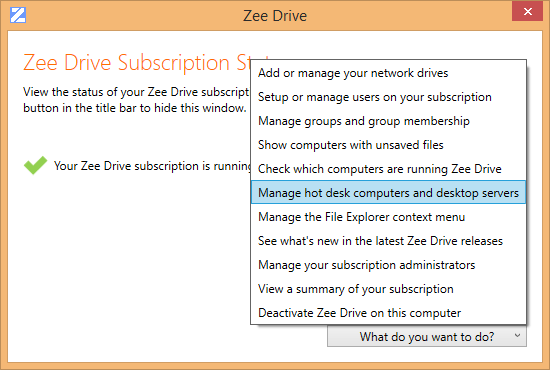 Zee Drive subscription administrators can choose whether or not to show the search command on the File Explorer context menu. SharePoint Online does not index all file types. For example, application files (with the .exe file extension) will not appear in search results. 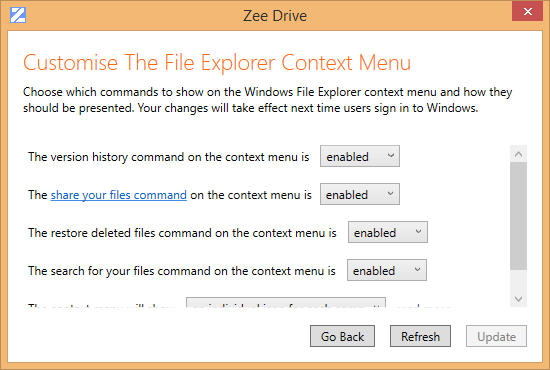 Zee Drive supports context sensitive commands directly from the Windows File Explorer context menu for operations such as viewing file version history or searching a folder. You can choose which, if any, of these commands to show on the File Explorer context menu and how the command icons should be displayed. 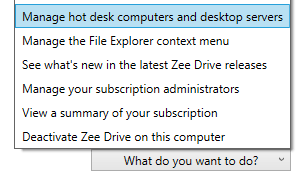 The Zee Drive subscription administrator can customise the context menu using the context menu customisation page. 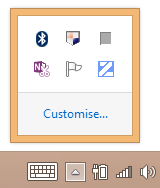 Choose the &apos;Customise the File Explorer context menu&apos; item. Now you can choose which commands should be shown on the Windows File Explorer context menu. Your changes will take effect the next time users sign in to Windows. Depending upon whether a folder or file is selected the context menu will show the appropriate commands for that item. This is how the context menu looks for a folder. And this is how the context menu looks for a file. You can choose to show only a single icon for the group of commands rather than showing an individual icon for each command. Choose the option &apos;a single icon for all the commands&apos; on the context menu customisation screen. Zee Drive will now show only a single icon for the entire group of commands. Note that the context menu commands will show only on 64 bit versions of Windows. Office documents can be opened from Zee Drive mapped drives for co-authoring using the co-authoring command from the File Explorer context menu. When opened for co-authoring the Office application (Word, Excel and PowerPoint) will connect directly to SharePoint thereby enabling the Office co-authoring features. 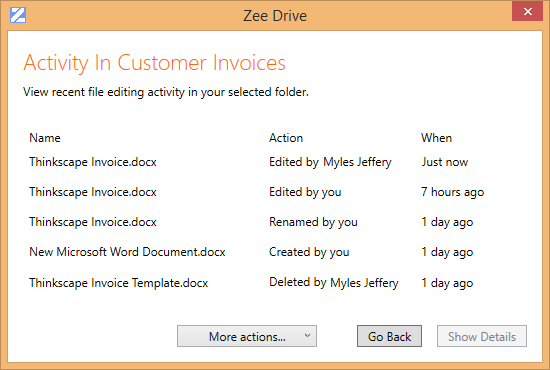 The default behaviour for Zee Drive is to lock Office documents exclusively when opened from a Zee Drive mapped drive. The co-authoring command provides a means to by-pass the locking and collaborate with colleagues on a document when the need arises. 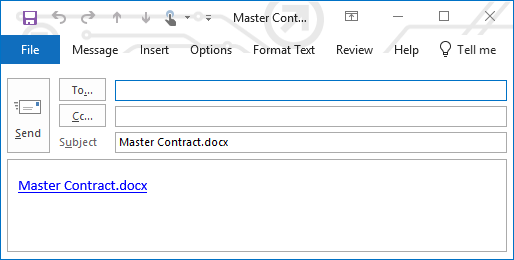 To open a document for co-authoring, select the Office document in File Explorer then open the context menu and choose the co-authoring command. The associated Office applicaiton, in the above example, Word, will then startup and connect directly to SharePoint to open the document, by-passing Zee Drive. Word may prompt the user to sign-in. After the first sign-in subsequent document openings should not require a sign-in. If other users have the document opened for co-authoring you will be able to see their edits live directly in your document. Zee Drive subscription administrators can choose whether or not to show the co-authoring command on the File Explorer context menu. The co-authoring command will only show on the context menu for Word, Excel and PowerPoint document types that support co-authoring. Zee Drive is available as a Windows Installer package (MSI) for organisations that wish to silently install, activate and upgrade Zee Drive using software management and deployment tools like SCCM and Windows Intune. The full list of support commands and usage of the Zee Drive MSI can be found in the Zee Drive MSI usage document. Click the button below to download the latest version of the Zee Drive MSI. Silent activation is only supported for hot desk computers, not personal computers or desktop servers. The MSI only supports silent operation via the msiexec.exe program with the /qn parameter. 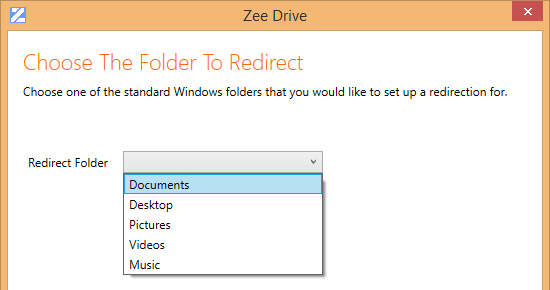 Zee Drive can redirect the standard Windows folders (Desktop, Documents, Images, Music and Videos) to OneDrive for Business automatically when a user signs in to Windows. If a user saves a file to a redirected folder such as Documents, the file will actually be saved to their OneDrive for Business instead. Folders can be redirected to the root of OneDrive for Business or to a subfolder in OneDrive for Business. If the subfolder does not exist then Zee Drive will automatically create the subfolder in OneDrive for Business. For example, the Documents folder can be redirected to the subfolder Home\Documents within users&apos; OneDrive for Business. If the Home\Documents subfolder does not exist Zee Drive will create it when the users sign in to Windows. The Zee Drive subscription administrator configures the folder redirections centrally through the administration console. By default folder redirections will be applied to all users on all computers where Zee Drive is activated. Administrators can limit folder redirections to be applied to specific groups of users or only to hot desk computers and desktop servers (I.e. computers with non-persistent environments). 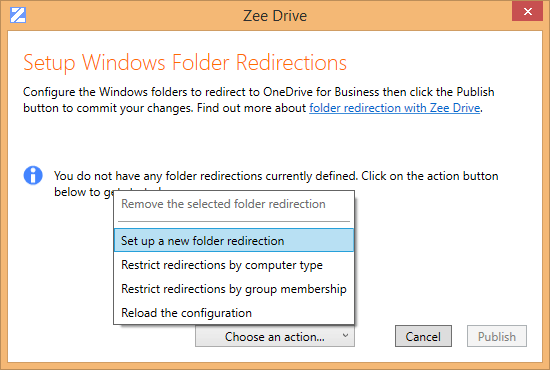 Note that Zee Drive folder redirection requires that a network drive or virtual folder is first mapped to the connection option &apos;OneDrive for Business of the signed in user&apos;. If this has not been set up then folders will not be redirected when users sign in to Windows. 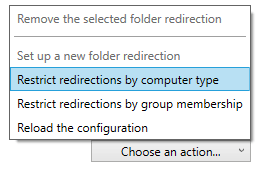 To set up a folder redirection, choose the &apos;Setup Windows folder redirections&apos; option from the administrator menu. Click the action button and choose the &apos;Set up a new folder redirection&apos; option. Choose a folder to redirect, in this example we will choose Documents, then click the Next button. Now choose where to redirect the folder to. It can either be to the root of OneDrive for Business or to a subfolder (up to 3 folders deep) within OneDrive for Business. Your new folder redirection will then be listed. Repeat this process for other folder redirections you want to set up. You can choose to restrict the types of computers and the users (by group membership) that the folder redirections will be applied to by choosing one of the restrict options. Any restrictions you configure will apply to all the redirections. After you have made your folder redirection changes click the &apos;Publish&apos; button. The next time a user signs in to Windows, Zee Drive will apply the redirections you have set up. When the desktop folder is redirected, the desktop will initially show as an empty folder until the Zee Drive startup process has completed. Once startup has completed the users will then be able to see their files on their desktop. Recent file editing activity (creating, renaming, moving, editing and deleting) can be viewed directly from the Windows File Explorer context menu. When choosing the recent activity command from the context menu, Zee Drive will show the last 7 days of activity by you and your colleagues in the selected folder. This can be helpful to discover quickly who has changed or deleted particular documents. You can extend the scope of the activity to the entire folder structure if you can&apos;t find what you are looking for directly in the folder selected. The activity can be exported to a CSV file which can allow you to filter and review the activity in more detail. Right click a folder in Windows File Explorer and choose the recenty activity command. Zee Drive will show the recent activity in the folder. Click the More actions... button to export the results to a CSV file or view all activity in the folder hierarchy. Zee Drive subscription administrators can choose whether or not to show the recent activity command on the File Explorer context menu. If an Office 365 user account has multi-factor authentication enabled, rather than using an Office 365 app password to sign in to Zee Drive which can prove to be complex for users, a user can authenticate with Zee Drive online using their second factor of authentication. This works through Zee Drive&apos;s support for the Azure AD Oauth2 modern authentication protocol. When a user is prompted to enter their credentials by Zee Drive they should click the multi-factor authentication link &apos;Verify your Office 365 credentials online&apos;. After clicking the link, the online sign-in form will pop up for the user to authenticate online. After signing in the user will be prompted for their second factor of authentication. The online form will close and Zee Drive will complete the authentication. Zee Drive can map a network drive to all the modern team sites that users have joined, including Microsoft Teams. Changes to user membership of modern team sites will automatically be reflected in the network drive; if users create a new modern team site, or join an existing one, then the new modern team site will appear in the user&apos;s mapped network drive in File Explorer automatically. If users leave a modern team site then it will be removed from File Explorer automatically. Create a new network drive and choose the &apos;Modern team sites&apos; connection option. Click the &apos;Choose...&apos; button to change how Zee Drive connects to the modern team sites. You can choose to connect only to the default document library in each site or to the entire site hierarchy. Choose the default document library connection option if you employ only a single document library per modern team site or want your Microsoft Teams channels to appear directly below the modern team sites in File Explorer. 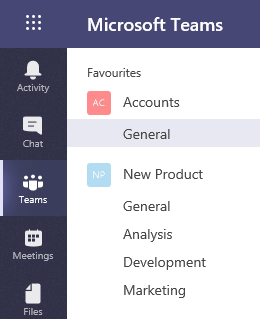 In this example two Microsoft Teams, Accounts and New Product, have a number of channels. 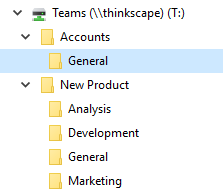 The channels will be shown directly below the Teams in File Explorer if the default document library option is selected. Users can send links to files and folders to their colleagues through the File Explorer context menu. Users can choose whether the linked file should open in its associated application or just highlighted in Windows File Explorer. For Office documents, users can choose to have the document opened read only or in presentation mode (for PowerPoint documents). To send a link to a file, right click the file in File Explorer and choose the send link option. The Zee Drive link dialog will open. There are different link options to choose from. Read only will ensure that your document cannot be overwritten when your link is clicked. Click the Next button. Now choose whether to copy the link to the clipboard or to send via an email. Clicking the link will test it out before you send it. Clicking the Open Email button will open a new email in Outlook with the link ready to send. When a user clicks on a read only link, in this example it is a Word document, Word will open the document for read only as can be seen in the title bar of Word. 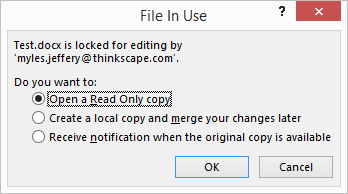 You can copy and paste the link in to documents such as Word or Excel. For a user to successfully open the link they will need to be running Zee Drive and have the same network drive mapped. In the case of a link to a shared OneDrive for Business file or folder, Zee Drive will automatically resolve the path to the file or folder in the shared with me drive. When Zee Drive is installed on a personal computer, Zee Drive creates an entry in the user&apos;s registry hive to indicate to Microsoft Office that the Zee Drive URI protocol is to be trusted. This means that when a user clicks a Zee Drive link (one starting with zeedrive:) in an Office application, Office will hand the link over to Zee Drive to open without warning the user. For hot desk computers and desktop servers the Zee Drive URI protocol will not be trusted by Office by default so the appropriate registry entry will need to be created via Group Policy if you want to avoid the warning from Office when a link is clicked. Zee Drive provides two command line options that can be used to create or remove the trusted URI protocol entry in the registry. Refer to the Zee Drive command line usage document for more information. Zee Drive subscription administrators can choose whether or not to show the send a link command on the File Explorer context menu. If the send a link command is not enabled then links will not work when clicked. If you are considering deploying Zee Drive to your customers or integrating Zee Drive in to your broader service offering, then contact us to request a Zee Drive partner subscription. A Zee Drive partner subscription has specific support to help you setup and manage multiple customer subscriptions from a single interface. A Zee Drive partner subscription can help you to provide a "managed cloud file server" solution to your customers. Here are some of the key benefits of a Zee Drive partner subscription. A partner subscription starts with 3 partner user licences and can manage up to 20 customer subscriptions. Limits can be increased as your customer deployments and partner team grows. View the Zee Drive partner subscription agreement here. Here is a walkthrough of the key features of the partner subscription. View your full list of managed customer subscriptions from a single interface. New customer trial subscriptions are easy to setup. Just choose the "Start a new Zee Drive trial" option from the action button. Setup a customer trial directly from your partner subscription. Setting up a new trial is straightforward, only the Office 365 tenant name is required. Once setup has completed its available to manage immediately. Trial setup requires just the tenant name. You can put your organisation name and a custom information page directly in front of your customer using the white labelling options. Follow the wizard to setup white labelling and publish your settings. Your organisation name shows on the status screen to your customers. Clicking your organisation name or selecting the support contact option from the action button shows your custom information page. Your custom information page shows web addresses as clickable links. Access your files and folders in OneDrive for Business and Office 365 document libraries with mapped drives in Windows File Explorer. Drag & drop files and folders straight from your desktop, or even from Outlook, to your mapped drives. Create new Office documents directly from Windows File Explorer and then double click to open and edit them in Office. Rename and reorganise folders and files in your OneDrive for Business and team sites from Windows File Explorer through simple drag & drop or copy & paste operations. Wow – this is AWESOME software! Must have for anyone who wants to move to the cloud but keep the feel of the file server. We just love Zee Drive. No more sync errors to deal with! Our customers really like the familiarity of network drives and didn&apos;t want to lose that moving to Office 365. Zee Drive was just what we were looking for. We love your product, I don&apos;t know how we managed without it. It&apos;s really a joy and pleasure to work again like we did on a local fileserver but with all the benefits of the cloud! Zee Drive has been a great product for us (thank you!) and I really could not picture us moving forward with the cloud without it. Finally, Zee Drive is something we can love more than our morning coffee. We cannot recommend Zee Drive enough; unobtrusive, reliable and robust drive mapping for SharePoint Online and Office 365. We are very happy with Zee Drive. Its a solid service and causes us zero headaches. Choosing Zee Drive was the single best software decision I have ever made! We cannot live without Zee Drive. Zee Drive makes our SharePoint Online experience so much more reliable, this is THE must have app for anyone moving to the cloud. Zee Drive is one of the soundest pieces of software I have ever come across. Every base is covered and it just works! Ready to upgrade your trial? Use the form below to purchase your Zee Drive subscription. 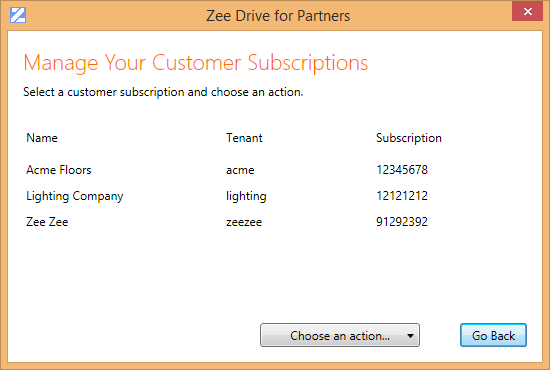 One Zee Drive subscription is valid for one Office 365 tenant. Which currency do you want to pay with? What type of organisation are you purchasing this subscription for? The type of organisation determines your pricing plan. How many personal computer user licences do you need? A user assigned this licence can run Zee Drive on up to 3 computers each. They can also use Zee Drive on hot desk computers and desktop servers. How many shared computer licences do you need? A hot desk computer requires one shared computer licence, a desktop server requires one shared computer licence for each concurrent user signed in to the server. How many shared computer user licences do you need? 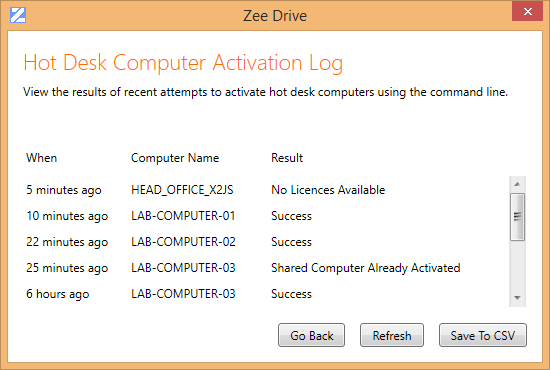 Users assigned this licence can use Zee Drive on hot desk computers and desktop servers only. What kind of subscription would you prefer? *To purchase licence quantities of 1,000 and more, or for alternative payment options, or if you want to add more licences to an existing subscription please contact Thinkscape Limited. The latest version of Zee Drive is available from the download link below. If you are upgrading Zee Drive, first download the new version to your computer and run it. Click the Upgrade button and follow the wizard steps to complete the upgrade. If the Upgrade button does not show then you are already running the latest version of Zee Drive. For hot desk computers and desktop servers you will need to enter your administrator username and activation code first then click the blue link to continue with the upgrade. You can automate the upgrade of Zee Drive using the command line. Refer to the Zee Drive command line usage document for more information. Zee Drive is also available as an MSI for automating the upgrade. Refer to the Zee Drive MSI usage document for more information and download the latest Zee Drive MSI here. The latest version of Zee Drive is v42 released on the 19th April 2019.
v42 - Zee Drive search queries now support searching for phrases and limiting search results to specific document types. To search for a phrase enclose your keywords in double quotes for example "new project proposal". To limit search results to specific document types enter the document extension with a leading period character E.g. enter .docx in the search query to limit results to Word documents. Resolves an issue where search would fail if a folder contained an ampersand character or an apostrophe character. v41.1 - Context menu search now supports searching for folders as well as files. The option to search for folders is provided as a radio button choice on the search query page. v40.6 - The icon separator on the Zee Drive context menu may not have shown under some circumstances. v40.5 - Reduces the delay for the contents of a network drive connected to shared with me to show when the drive is first opened. v40.4 - Resolves an issue where Zee Drive would not prompt the user to re-authenticate when the authentication token had expired due to a forced MFA expiration policy in Azure AD. v40.3 - Users can now send links to files or folders to their colleagues from the File Explorer context menu. Users can choose what happens when the link is clicked; open the file in the associated application, open it for read only, or highlight it in File Explorer. Resolves an issue where a shared folder in the shared with me drive may show as empty. v39 - Introduces a new connection option &apos;Modern team sites&apos; to connect a single network drive to all the modern team sites users have joined (this includes Microsoft Teams). Changes to users&apos; modern team site membership will be automatically reflected in their network drive. v38.6 - Fixes an issue when viewing the list of active users on a desktop server the vertical scroll bar would not show. Adds a new capability to export the list of active users on a desktop server to a CSV file. v38.5 - Support for multi-factor authentication using Azure AD Oauth2 modern authentication. When a user is prompted for their credentials by Zee Drive they can now authenticate online with their second factor of authentication. v37.1 - Recent file editing activity can now be viewed from Windows File Explorer. Right click a folder and choose the recent activity command. Activity can be exported to a CSV file for detailed analysis. v36.1 - The group membership of a user can be viewed and managed directly from the user administration screen. Select a user and then choose the &apos;Manage the group membership for this user&apos; option from the action button. The groups the user is a member of will then be listed. v35.2 - Resolves an issue where a password change of an Office 365 user&apos;s account could cause the account to be locked because Zee Drive would attempt to authenticate with the old password repeatedly until the password was updated in Zee Drive. v35 - Excel document versions can now be compared. Select two versions from the version history page and choose the compare option. The Office 2016 Spreadsheet Compare tool is used to perform the comparison. v34.2 - Resolves an issue where all matching search results may not have been shown. v34.1 - Improvements to file search results available from the &apos;More actions&apos; button - search results can now be ordered showing the most recently modified files first. Search results can be exported to a CSV file. v33 - Support for the Office 365 German cloud with SharePoint Online domain names ending with sharepoint.de. v32.7 - Resolves an issue where a folder may have shown as empty or an error &apos;Windows cant access this disc&apos; is shown by File Explorer. The issue was caused by a SharePoint Online service API change by Microsoft. v32.6 - Fixes an issue where a file may have shown as a failed file upload in the file recovery area even though the file had successfully uploaded. Fixes an issue where an Office file could not be overwritten if the first save attempt failed due to a network error. v32.4 - If there was an internet connectivity issue at time of closing an Office document and the document was subsequently re-opened it may have opened read-only. v32.3 - Resolves an issue where a file that failed to open due to a temporary network error would subsequently not open at all until Zee Drive was restarted. Zee Drive now sends an HTTP User Agent string with each request to SharePoint as per Microsoft&apos;s guidance for ISV applications to mitigate throttling from SharePoint. The User Agent string can be used by Microsoft to correlate requests from Zee Drive to help troubleshoot SharePoint service issues. v32.1 - Resolves an issue for new installs of Windows 10 Redstone 4 April update that could block the Zee Drive file system driver. v31 - Standard Windows folders Desktop, Documents, Pictures, Videos and Music can be redirected to OneDrive for Business automatically with Zee Drive when users sign in to Windows. Zee Drive now permits Json files to be added to mapped drives. Resolves an issue where the customer list would not scroll when activating a shared computer from the partner subscription. v30.2 - Resolves an issue where a file copied to a Zee Drive mapped drive with Windows File Explorer in rare cases may show as zero bytes in size in File Explorer even though the file was successfully uploaded to SharePoint Online. v30.1 - Introduces support for file and folder names containing the percent and hash/pound characters % and #. Resolves an issue where changes from other users may not appear in mapped drives under specific circumstances. v29 - Support added for TLS1.2. Zee Drive now requires .Net 4.5 or above. v28.1 - Zee Drive now offers an option to retry startup if the startup fails on a public wifi network that requires browser authentication. v28 - Introduces file version management capabilities when viewing file version history. A selected file version can be opened in its associated application, file versions can be saved to the local computer, a file version can be restored, and Word file versions can be compared to check the differences made between versions. v27.1 - Zee Drive administrators can now save the list of users set up on the subscription to a CSV file. v27 - Office documents can now be opened for co-authoring directly from the Windows File Explorer context menu. For existing subscriptions the default is for the co-authoring command not to be shown on the context menu. Subscription administrators can change this setting from the context menu customisation page. v26 - Zee Drive can now optionally show an individual icon for each of the context menu commands. For existing subscriptions the default is to show a single Z icon for the group of commands. v25.4 - When connecting a drive to a site hierarchy Zee Drive will now only show subsites that a user is a member of. Previously a subsite would be shown even if the user does not have permissions to the subsite. This version supercedes v25.2 which had a regression issue where for some users an error may occur browsing the site hierarchy folders. v25 - Search for files quickly using SharePoint Online&apos;s full text search index directly from the Windows File Explorer context menu. Right click a folder then choose the search command from the context menu. For existing Zee Drive subscriptions, administrators will need to enable the context menu item first as it is disabled by default. v24.3 - Resolves an error where a file copied to a Zee Drive mapped network drive with Windows File Explorer would fail to upload if approximately 300MB in size or larger. Resolves an issue where Windows File Explorer would freeze when copying large files to a Zee Drive mapped network drive until the file copy had completed. Resolves an issue when on public WiFi networks an error "expectation failed" could occur on Zee Drive startup. 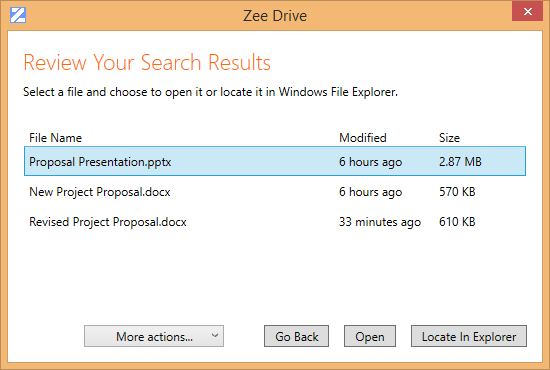 Zee Drive now supports copying files up to 15GB in size with Windows File Explorer to a Zee Drive mapped network drive. 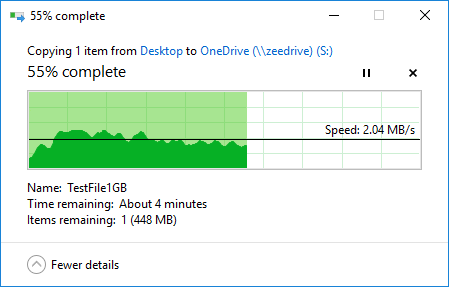 When copying a file to a Zee Drive mapped network drive with Windows File Explorer, the File Explorer progress window will now accurately show the actual progress of the file being copied up to SharePoint Online/OneDrive for Business. v23.2 - Deleted files can now be restored directly from the Windows File Explorer context menu. Right click a folder you have deleted files from then choose the restore command from the File Explorer context menu. For existing Zee Drive subscriptions, administrators will need to enable the context menu item first as it is disabled by default. v22.8 - Resolves an issue where Windows File Explorer may show an error &apos;Location is not available&apos; when selecting a subfolder in a network drive connected to &apos;shared with me&apos;. v22.7 - A shared folder with spaces in the name in a network drive connected to &apos;shared with me&apos; may have shown as empty. Renaming a folder containing thousands of items may have failed. v22.6 - Resolves an issue in the administration console when setting up a new mapped drive and connecting it to a document library or team site, some sites (modern team sites) would not appear in the &apos;sites&apos; node. Added a facility in the administration console to enter the path of a team site directly when connecting a drive if it does not appear in the &apos;sites&apos; node. The &apos;Office 365 Group Files&apos; connection option has been removed from the administration console connections drop down list as this functionality duplicated what can now be achieved through the team site and library connection options. Resolves a rare regression issue where a folder can appear empty if an item in the folder has emoji in the file name. v22.4 - Resolves issue where Zee Drive startup may fail with error &apos;unsupported records version 0&apos;. v22.3 - When a folder is now renamed files within the folder will retain their modified dates and not change to the current date and time. This version supercedes v22.2 which had a regression issue where some folders may have shown as empty. v21.2 - Support for longer URL paths up to 400 characters in length. v20.11 - Resolves an issue when after saving the same Office document multiple times the save may fail with an error &apos;There has been a network or file permission error. The network connection may be lost&apos;. v20.8 - Provides option to retry startup process where startup may fail with an error &apos;Call was canceled by the message filter&apos;. v20.7 - Zee Drive supports multi-user desktop server environments such as RDS, XenDesktop, XenApp and VDI. Zee Drive administrators can activate Zee Drive on desktop servers then manage the licence pool and monitor active users directly from the Zee Drive administration screens. v19 - Users can share their files from their OneDrive for Business directly from the Windows File Explorer context menu. 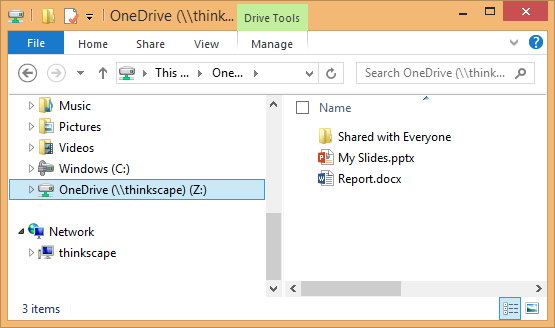 Right click a file or folder from your OneDrive for Business mapped drive then select the share your files command. For existing Zee Drive subscriptions, administrators will need to enable the context menu item first as it is disabled by default. v18.3 - Resolves an issue where app passwords with federated identity MFA enabled user accounts would fail authentication with Zee Drive. v18.1 - Resolves an issue where changes made by other users would not show in a drive connected to shared with me files. v18 - New connection type added; map a network drive or virtual folder to shared with me files. Users will need to be running this latest version of Zee Drive otherwise the network drives connected to shared with me will show as empty. v17.7 - Resolves an issue where libraries and subsites might not show when mapping to a site hierarchy. v17.5 - Resolves an issue with Windows 7 where the version history command would not show on the context menu. v17.4 - File version history can now be viewed directly from the File Explorer context menu. Right click a file then select the show version history command. Zee Drive will show the file version history of the selected file. For existing Zee Drive subscriptions, administrators will need to enable the context menu item first as it is disabled by default. .Net 3.5 support has been discontinued. 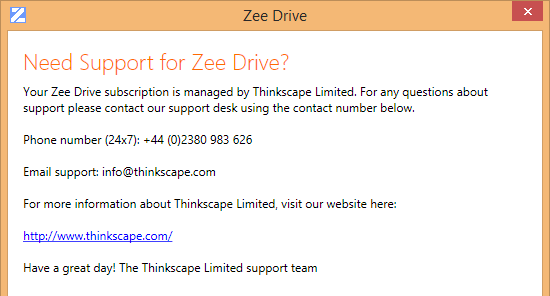 Zee Drive is supported with .Net 4.x. v16.1 - Resolves an issue where TMP files would appear after creating a new Excel worksheet from the Windows File Explorer new file context menu. v16 - New connection type added; map a network drive or virtual folder to a SharePoint Online team site or an entire team site hierarchy. Users will need to be running this latest version of Zee Drive otherwise the network drives connected to a team site will show as empty. v15 - Zee Drive shows changes from other users on-demand - if a file or folder change is not yet showing in a mapped drive click F5 in Windows File Explorer to show the latest file and folder changes. v14.2 - Fixed a minor display issue on manage shared computers screen. v14.1 - Shared computers are now supported in non-domain joined environments - users will be prompted for their Office 365 username the first time they sign in to a shared computer that is not domain joined. The AD username lookup attribute for domain joined shared computers can now be configured from the administration screens. v13.3 - Improved compatibility with Citrix XenApp applications and older Windows applications specifically AutoCAD 2010, Photoshop 7 where a file would fail to save. v13.2 - Command line support for installing and activating Zee Drive as a shared computer using a shared activation code and without need for user interaction. v12.11 - Resolved authentication issue with 3rd party authentication provider OneLogin. v12.10 - Minor change to file handling behaviour that may improve compatibility between Zee Drive mapped drives and some applications. v12.9 - Resolves an issue where file changes appear in a mapped document library subfolder when they should not. v12.8 - Zee Drive supports activation of shared computers. A shared computer is where many people may be using the same computer but only one person will be on the computer at a time. Resolves an issue where Zee Drive may fail to startup with error "credentials not found in credential store". v11.1 - Recovered files can now be discarded instead of saved if users do not want to keep them. Resolves an issue that could cause Zee Drive to fail startup on a retry. v11 - Resolves issue where printing to PDF from Office would fail using Adobe PDF writer. Resolves issue where AutoCAD would fail to save a DWG file to Zee Drive. v10.2 - Resolved an issue where mapped drives would not show changes made by other users which was caused by the connected document library exceeding the SharePoint lookup column threshold. v10.1 - Fixed issue where folder contents might not show if user does not have permissons to root folder of document library. Fixed issue where a very large file upload could fail. Zee Drive supports new file recovery feature; files that fail to upload are recovered by Zee Drive and can be saved by end users, Zee Drive subscription administrators can track which computers have unsaved files, Zee Drive supports a file recovery mode to recover unsaved files from computers where Zee Drive has been deactivated. v9.19 - Zee Drive is more resilient at startup to internet connections that are slow to be established. Resolved issue that could cause a second activated Zee Drive subscription to not startup on the same computer. v9.8 - Zee Drive now shows the contents of folders that contain thousands of items, previously these folders may have shown as empty. v9.6 - Resolves an issue where an invalid session error would prevent Zee Drive from starting up even though the computer had not been deactivated. 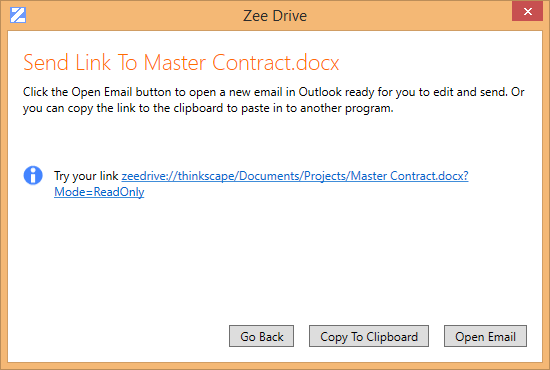 v9.5 - Office documents with read permissions now open as read only from Zee Drive. v9.4 - Resolves issue where saving files with paths too long for Office 365 would silently fail. Support for file locking of Excel .xlsm files. Updated driver to resolve some rare issues. v9.3 - Resolves an issue on partner subscriptions when setting up groups from the target mapped drive screen. v9.2 - Administrators can check which computers and users are running Zee Drive and export a report to a CSV file. Administrators can check for new releases of Zee Drive. Only administrators need install this update. v8.8 - Introduces a new partner subscription to help partners white label and manage customer subscriptions. Zee Drive now shows a summary of all file upload and download activity in the past 24 hours. v7.1 - Resolves an issue where drives could be temporarily or permanently disabled after computer wakes from a sleep. v7 - Zee Drive now supports connecting drives and virtual folders to Office 365 group files. v6 - Summary screen available off the action menu showing details about your subscription. Non-administrators can view information about their activated comptuer. v5.9 - Fixed issue that could cause cache to become stale and not reflect actual state of files and folders in document library. v5.8 - Fix for crash when copying activation code to clipboard after setting up new user or setting up new trial. v5.7 - Resolved issue where Office documents with + character in would not release lock. Resolved issue handling paths containing Hebrew or Kanji characters. v5.6 - Added support for .Net 4.x and resolved issues with Windows 10.
v4.5 - Resolved issue where adding new user with uppercase characters would prevent group membership from working. Resolved crash when copying activation code to clipboard. Resolved issue using third party identity provider where Zee Drive would not prompt for new password. v4.4 - Added support for assigning other users Zee Drive administrator privileges. v4.3 - Resolves a performance issue browsing folders with Windows File Explorer. v4.2 - Added facility to bulk setup users on subscription by importing from CSV file. v4.1 - Resolves issue where wrong file modified date is shown. Resolves issue where saving a file does not refresh the modified date in Zee Drive. v4 - Zee Drive will now prompt users which computer to deactivate if all their activations are used up. Improved error handling of invalid file names. Resolved issue renaming file to the same name but with different case. v3.4 - Resolves issue in administration screens where Zee Drive would map to subfolder in library when root of library selected. v3.2 - Support added for locking Office documents, and resolves an issue where an Office document might not open.